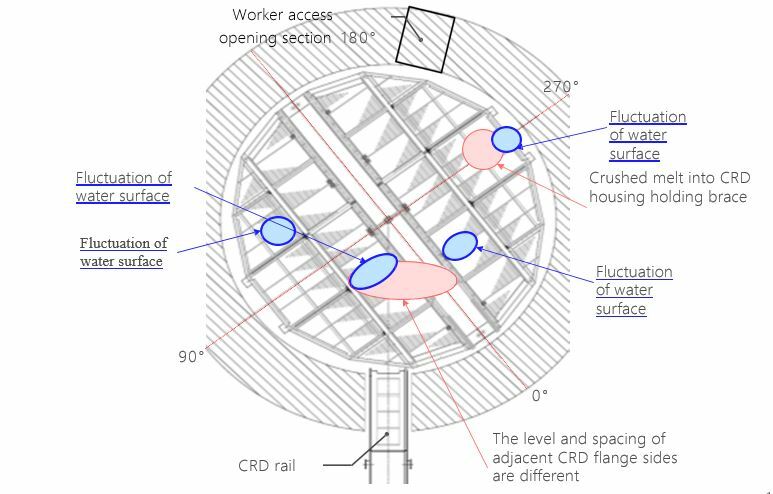 TEPCO released additional information related to the pedestal area inspection inside unit 3. Among this new data was some unexpected findings. In two peripheral locations in the pedestal they found the top lifting handle of a fuel assembly and in the other a bottom section of a control rod. Neither were melted but were found near other melted debris. How they found their way into the pedestal is currently a bit of a mystery but we have some ideas how this could have happened. 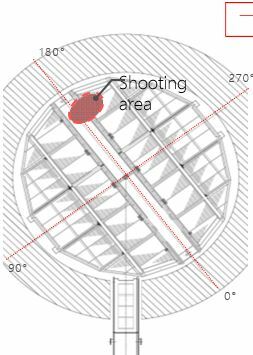 The image below shows the area where the photo of the fuel assembly lifting handle was found. This is the handle on the top of a bundle of fuel rods used to move the fuel assembly within the reactor and eventually to the spent fuel pool. In the diagram below the lifting handles can be seen on the top of the fuel assemblies as the U shaped top handle. 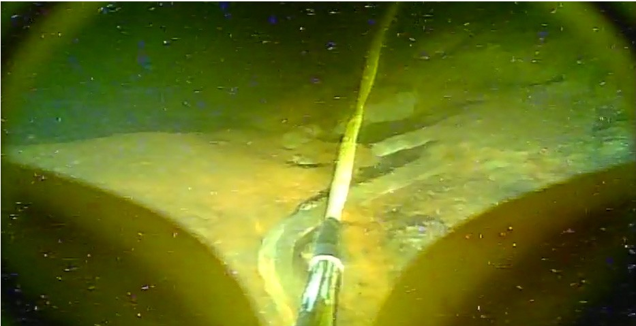 The image below taken by the Sunfish swimming ROV inside unit 3’s pedestal shows what appears to be a portion of a lifting handle for a fuel assembly. 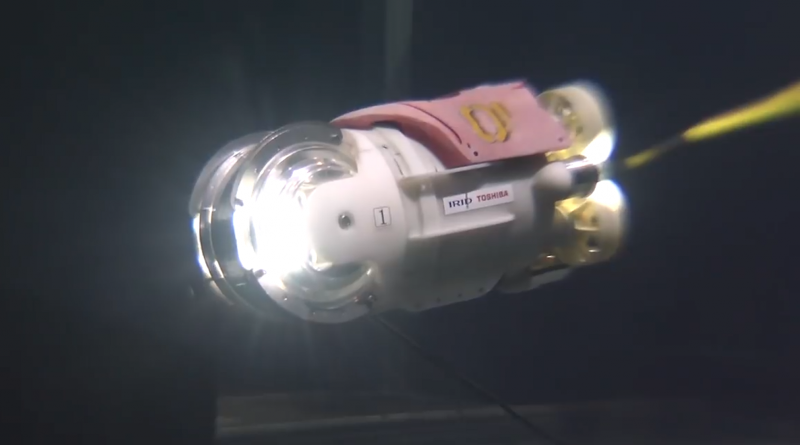 The handle can be seen below the cable for the ROV. 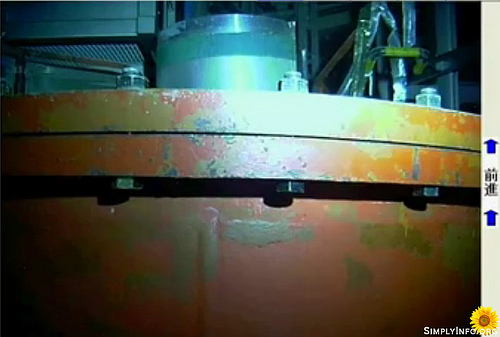 TEPCO estimated the width of this handle and confirmed it is the same width as a fuel assembly lifting handle, increasing the probability of it being that piece of equipment. It seemed unlikely that intact pieces of equipment would end up in the pedestal from the reactor. The reactor vessel did not have a large sized failure. 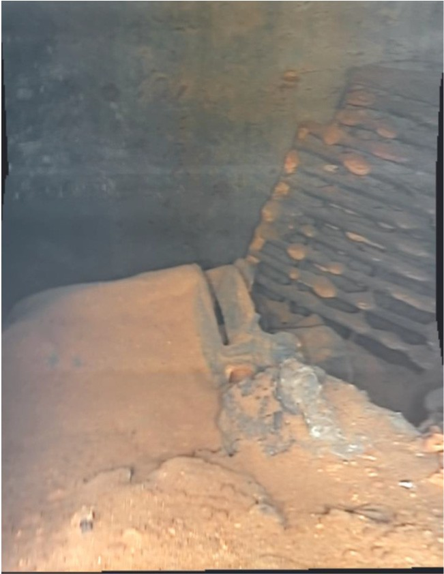 Instead, it was found that a series of small holes in the lower portion of the reactor vessel allowed the molten fuel to flow into the containment pedestal area. 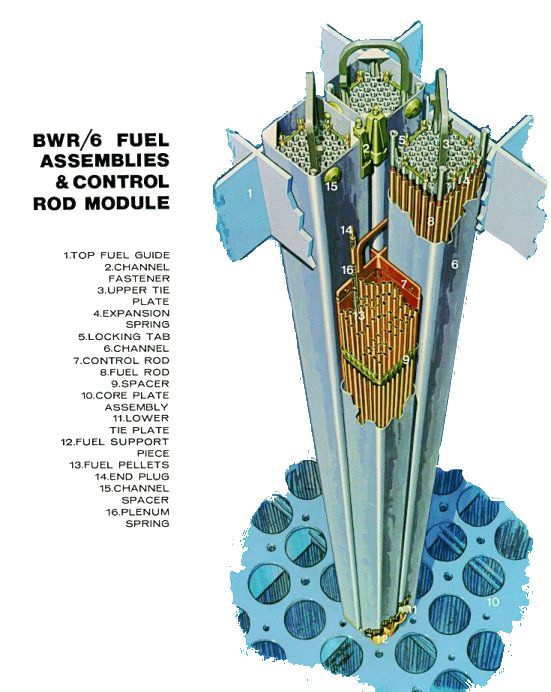 Within the new document was a somewhat cryptic explanation of “dummy” fuel assemblies along with this diagram of the reactor core. What this might mean is that fuel assemblies that did not contain any nuclear fuel were used in the reactor at the time of the disaster. These dummy fuel assemblies would have acted as a place holder and may have been used as part of a design to better control the nuclear reactions in the core. The red squares show where these “dummy” assignments were per TEPCO. Why the partial piece of a fuel assembly was found in this area might be explained by the lack of nuclear fuel in these assemblies. If the nearby fuel melted these non fuel structures could have exited the vessel after the melted fuel. The bottom of the reactor vessel is curved. This would cause molten fuel to flow into the lower center portion. This may explain why the most damage was found closer to the center and why they only find water running out of the damaged reactor vessel near the center damage areas. In the image below the lower section of a control rod can be seen. This closely matches the wider flange area of a control rod. 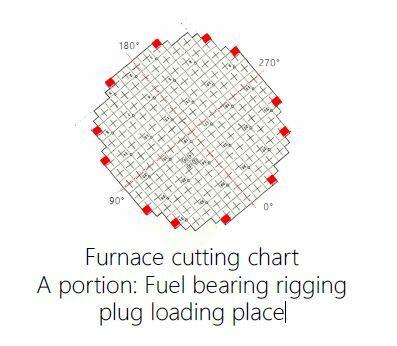 The diagram below shows a control rod with the found flange piece outlined in red. The section is flagged as a fall speed limiter. 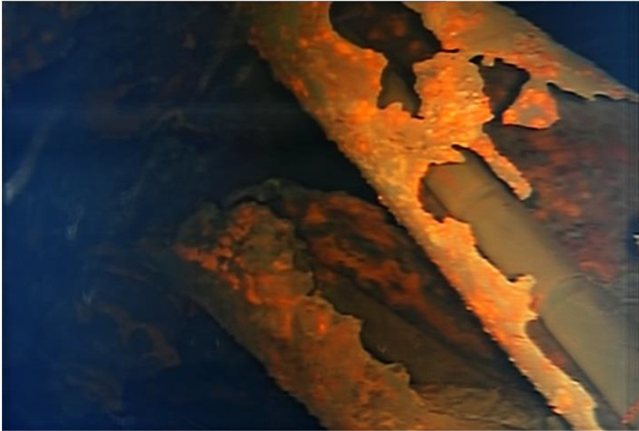 In the TEPCO slide below the two photos to the right show an upward look in the area where the control rod fall speed limiter was found. 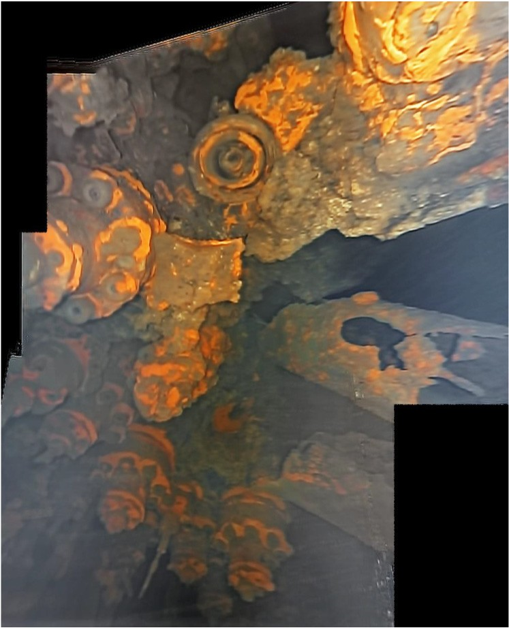 This shows evidence of melted fuel having dropped through but no significant structural damage. 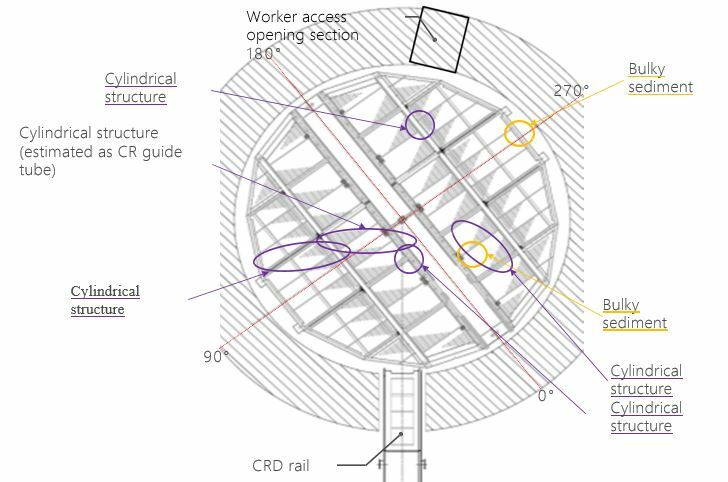 The two diagrams below show the combination of “cylindrical structures, sediment and locations where water was found leaking out of the reactor vessel. These cylindrical structures were determined by TEPCO to be control rod guide tubes. Inside at least one of these guide tubes were pieces of an un-melted control rod. The locations of the pieces of control rod guide tubes overlap with the areas of water leakage. These also overlap with areas where the worst damage to the lower reactor structures (control rod systems) were found. All of these findings indicate a slow failure of the reactor vessel. An abrupt failure would have seen a large section of the reactor vessel fail all at once. A slow failure would only indicate that the molten fuel ejected from a limited number of locations. 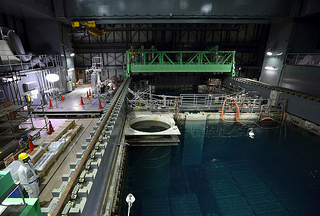 The round tubes in the next two photos are the control rod guide tube sections cited by TEPCO. In both images they appear to be hanging down from the control rod systems. These new findings and how these objects ended in the pedestal requires more investigation. 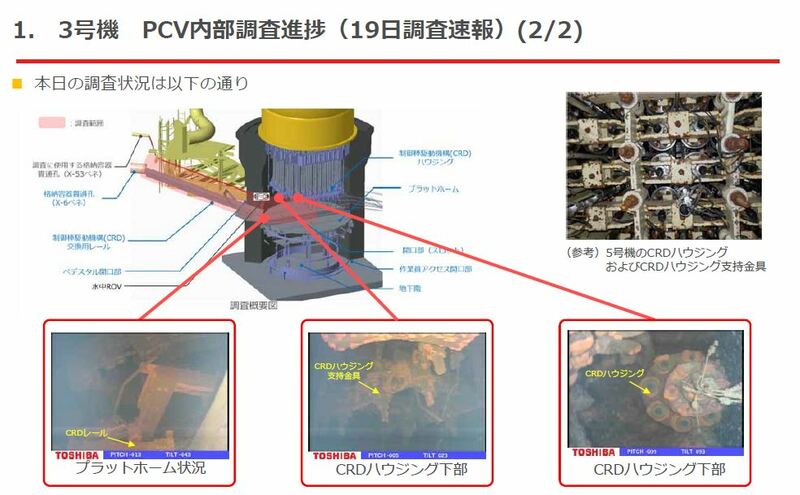 TEPCO has additional inspections inside unit 3 planned. This future work may help determine with more detail how these failures progressed during the disaster. 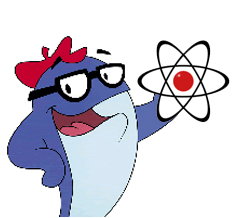 What is really going on at Fukushima Daiichi, an update.